Add distinctive style and sensible storage to you home with this round hand woven rattan basket. 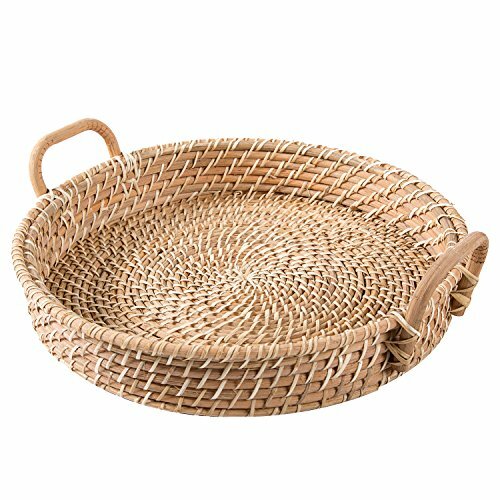 It's decorative woven design and wood handles let you use this basket as a serving tray or as a display basket. With its natural beige color and catch all abilities, you can employ this basket into any room. Display this beautiful basket on your kitchen table or counter for holding fruit, vegetables, treats or for serving desserts, appetizers and drinks. Leave it in your living room on your ottoman or coffee table for added elegance and storage for beverages, television remotes, magazines or decorative items. Add it to your bathroom for cosmetics, makeup, toiletries or hand towels. With two wooden rectangular handles, you can carry this basket from room to room for extra storage, or while serving hor d'oeuvres with ease. Anyway or anywhere you utilize this natural rattan basket, it is sure to create organization and a stylish environment. Approximate Dimensions (in inches): Basket with Handles - 5.0 H X 18.25 W X 17.0 D; Basket Only - 2.75 H X 17.25 Diameter. Elegant round rattan serving basket and display tray with natural beige hue. Features naturally hand woven rattan and wicker material with round design and two wood handles, allowing you to carry this basket with ease. Perfect for storing and displaying fruit, bread, magazines, remotes, serving ware and much more, on your ottoman, table, counter or shelf. View More In Bread Baskets.